Eyes are the most vulnerable and sensitive part of our body. Irritation and redness is usually caused due to air borne allergens and other particles. Eye allergies can be caused due to cigarette smoke, perfumes, mascara, eye liner, diesel exhaust etc. 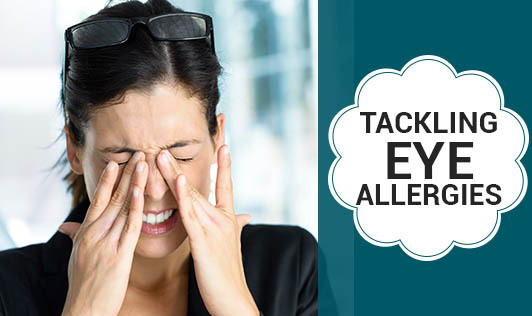 Here are some tips to reduce exposure to allergens that affect your eyes. • Wash your eyes after you come back from anywhere outside. If you have an itchy eye, washing it with water will help wash out the allergens and a cold compress would give a soothing effect. • Avoid rubbing your itchy eye as this will only irritate it more and worsen your condition. • Wear goggles or sunglasses when outdoors as this will minimise dust and other allergens from getting into your eyes. • Pollens are a cause for most eye allergies. Close windows especially at night and early in the morning since pollen counts tend to be highest at those times. • Reduce dust exposure at your home, especially in the bedroom. Bedding like pillows etc should be cleaned regularly. • Replace carpeting with hard wood or tiles that are easier to keep dust- free. • Reduce indoor molds caused by high humidity by cleaning bathrooms, kitchens and basements regularly. These are simple steps to minimise the chances of you developing eye allergies.